What Happens in a SCOTUS Tie? How the court operates with a justice out sick. 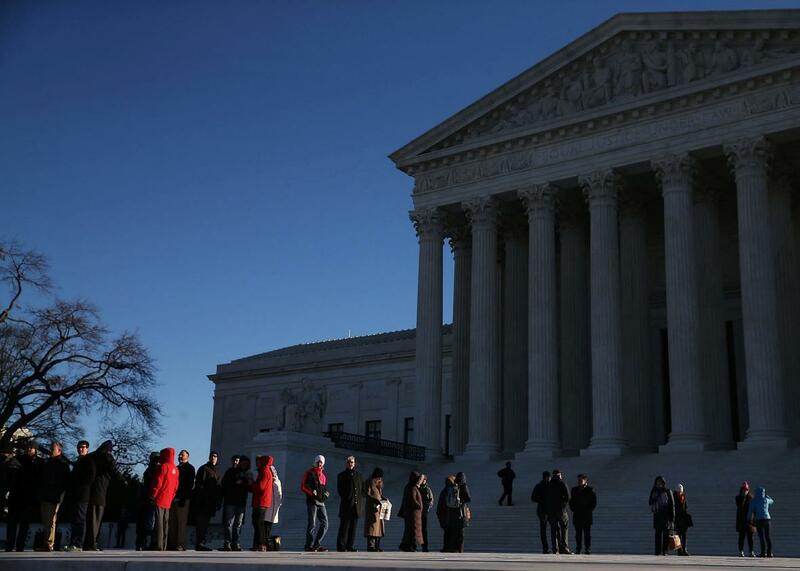 People wait in line to enter the Supreme Court in January in Washington. On Saturday, Justice Antonin Scalia died at age 79. What happens now at the Supreme Court? In 2004, after Chief Justice William Rehnquist was absent from the court after an operation, Brendan I. Koerner asked what happens when the Supreme Court has eight justices. The original is reprinted below. Despite his plans to the contrary, Chief Justice William Rehnquist has yet to return to the Supreme Court after his tracheotomy last week. Instead, according to an official statement released yesterday, the 80-year-old Rehnquist will be working from home as he recuperates. How will the court function in Rehnquist’s absence, especially if another contested election gets thrown its way? Although he is confined to his house for the time being, Rehnquist can still participate in Supreme Court decisions. Justice John Paul Stevens, who is subbing as chief justice with Rehnquist gone, made this clear yesterday when he commented that his cancer-stricken colleague “reserves the right” to cast his vote in upcoming cases. That includes cases for which the chief justice isn’t physically present for oral arguments; he will rely on transcripts and written briefings instead. That’s actually a bit unusual, since Supreme Court justices often abstain from the decision-making process when they’ve missed oral arguments. In March of 1972, for example, Rehnquist chose not to participate in the decision in Eisenstadt v. Baird, which granted unwed couples the same access to contraceptives as their married counterparts; he held out because he’d been on the court for only two months and had thus not been present for oral arguments the preceding November. Yet there is no written rule barring absentee justices from casting their votes, so Rehnquist’s work-from-home plan is perfectly legit. Since little is known about the severity of Rehnquist’s thyroid cancer—the Supreme Court refuses to release any details—it’s impossible to know how long the chief justice will be absent from the bench. If his health takes a dramatic turn for the worse and he is unable to participate even from home, it’s possible that an eight-person court could hear any election challenge. That means a 4-4 split is likely. Although rare, 4-4 ties are hardly unheard-of—justices do recuse themselves from time to time. A split decision effectively upholds the ruling of the lower court (presumably a state supreme court). In the event of such a tie, the court typically issues what’s known as a per curiam decision. The opinion in such a decision is issued under the court’s name, as opposed to consisting of a majority and a minority opinion. Justices, however, may attach dissenting opinions to the per curiam decision if they like—as happened in Bush v. Gore. When a 4-4 deadlock does occur, the case is not deemed to have set any sort of precedent. Tradition holds that the court’s per curiam opinion in such ties is usually very, very terse, often consisting of no more than a single sentence: “The judgment is affirmed by an equally divided court.” But it’s a safe bet that the opinion in Kerry v. Bush or Bush v. Kerry would be a lot longer than usual.